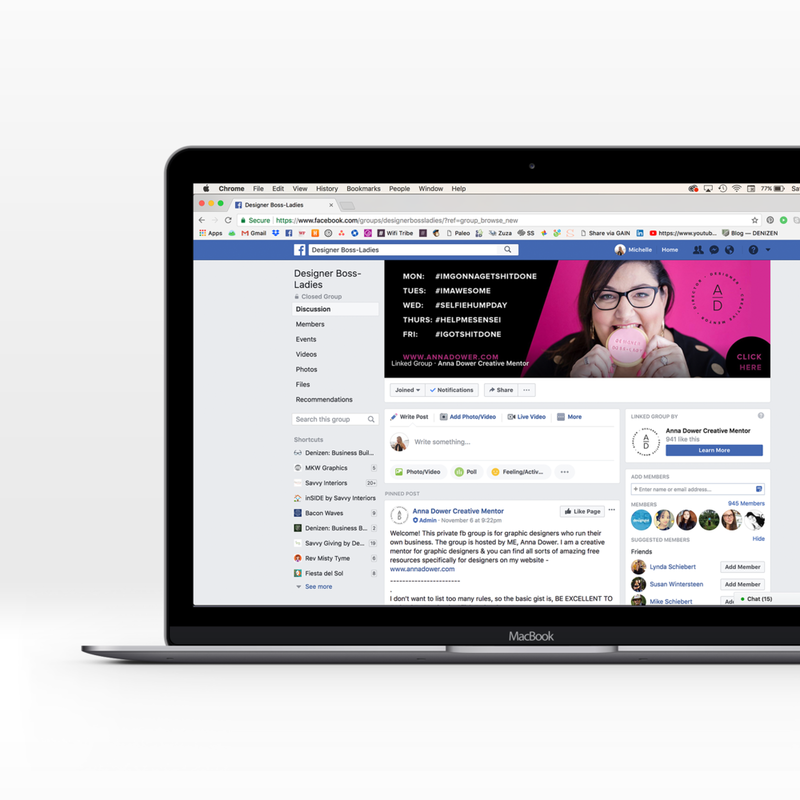 ALLL my favorite Facebook Groups for Freelance Advice — MKW Creative Co.
Facebook groups totally changed the way I thought about doing business online. While the bulk of my clients come from referrals, it is still highly advantageous to be in facebook groups with like-minded individuals who can give feedback, advice, or present questions and discussions that make you think outside the box. Here are my favorite facebook groups, broken down by number of members, what they are good for and how I use them! GREAT FOR: San Diego based entrepreneurs and small business owners. Boss Babes Brunch Club hosts events, workshops and a small business incubator series for those looking to get started in launching their business. HOW I USE IT: I have had the pleasure of working with plenty of boss babes (Right Hand Business Coach, Simple Wellness Co, Balanced by Katie, North County Natural Medicine, Sistered States, Elwynn and Cass, Eliza Rose Vera). I love sharing the work that we have collaborated on in the group. I also will ask Boss Babes via poll which kinds of freebies, blog content, or social they'd like to see from me! GREAT FOR: Graphic Designers looking for advice on everything from contracts, client on-boarding, invoicing, design programs and tools. Also great for sharing your successes, blogs, projects on a regular basis. HOW I USE IT: There are days of the week dedicated to sharing your wins. With three years under my belt, I have a little more experience than some of the other designers in the group, so I love sharing what I have learned with the others on the page. There are also some good designer inside jokes and venting sessions that go on... definitely helpful to hear others' stories! HOW I USE IT: If I have a design related question, this is the first place I go. For example, I couldn't for the life of me figure out how to change the color of the cart icon in Squarespace. I posted in Savvy Business Owners, and within minutes, I had a whole string of comments from other creatives on how to get what I needed done. This group is also great when you need something specific done that might be out of my wheelhouse. There are also great opportunities to work with other members within the group. However, with so many members, you might not feel like you've got a fighting chance to get your name in on a cool project or opportunity. HOW I USE IT: This is a great platform for blending travel advice and working remotely. It is super reassuring to know there is a whole community of women all over the world who are in a similar place as I am. The group also encourages collaboration between members through weekly callouts for social media handles, blogs, websites, instagram handles, etc. HOW I USE IT: I love seeing the images, stories, and nuggets of advice that come out of this group. With so many members, there is some good get-your-popcorn drama that goes down in the comments. However, this group is super helpful if you need "a restaurant in ___" or a "hotel in ___" kind of suggestions. PACE YOURSELF: I definitely binge added facebook groups and I definitely don't suggest doing that. If you're new to the facebook group scene, add two or three that you think might be helpful and get an idea for the pace of the group and if the posts are relevant to you and your business/life. MAKE AN INTRO: When you request to join a new group, the moderators will probably have a questionnaire at the beginning. Once you've been accepted, don't forget to introduce yourself, your biz, and what you hope to glean from the group. Don't forget your social handles and be sure not to be spammy. Be genuine, and realize that the more you participate, the more you will gain from the group. DON'T GET DISCOURAGED: Some of these groups have thousands upon thousands of members, so if you post it might just get buried by all the other posts. Don't take it too personally. Give it a day or two and try again. THEY'LL BE COMPETITIVE: Often there are posts by members looking for your product or service. You'll get excited, hop in to comment, and then see that there are 20+ other members who offer EXACTLY what you offer who have already commented. It is so easy to fall down the rabbit hole of comparison by creeping on all of their pages and comparing your work to theirs. I'm not going to say "don't do this." Do it. See what else is out there. Learn from others and just see what other creatives are doing in your industry, but don't take it to heart. If anything, comment on those threads and compliment the 'competitors that you admire! It will go a long way. Preface your comment on the corresponding thread with something like "I would love to help if you get this far down the list!" REMOVE YOURSELF FROM GROUPS THAT AREN'T A GOOD FIT: Every few weeks, it's super important to edit the groups you're in. Leave the ones that are junking up your feed or not giving you the information, engagement or advice that you need. Keep the ones that provide valuable advice, leads, and create a community around your industry or interests. PRACTICE MODERATION: You can't possibly comment on every thread that pertains to you and your industry. Sometimes I find myself having spent wayyy too much time combing through facebook groups. Instead, set apart time (I set a timer) for yourself to go through, give advice, share a recent blog or ask questions. It helps to comb through when you have the time to, instead of letting it be a distraction from the work you need to do.